The Republic of Siena (Italian: Repubblica di Siena) was a historic state consisting of the city of Siena and its surrounding territory in Tuscany, central Italy. It existed for over four hundred years, from 1125 to 1555. In the Italian War of 1551–59 the republic was defeated by the rival Duchy of Florence in alliance with the Spanish crown. After 18 months of resistance, the Republic of Siena surrendered to the Spanish Empire on 21 April 1555, marking the end of the republic. The oldest aristocratic families in Siena date their line to the Lombards' surrender in 774 to Charlemagne. At this point, the city was inundated with a swarm of Frankish overseers who married into the existing Sienese nobility and left a legacy that can be seen in the abbeys they founded throughout Sienese territory. Feudal power waned however, and by the death of Countess Matilda in 1115 the border territory of the Mark of Tuscia which had been under the control of her family, the Canossa, broke up into several autonomous regions. Siena prospered as a city-state, becoming a major centre of money lending and an important player in the wool trade. It was governed at first directly by its bishop, but episcopal power declined during the 12th century. The bishop was forced to concede a greater say in the running of the city to the nobility in exchange for their help during a territorial dispute with Arezzo, and this started a process which culminated in 1167 when the commune of Siena declared its independence from episcopal control. By 1179, it had a written constitution. In 1286 the Nova government was established to rule Siena. The Nova was backed by the Noveschi, a political party formed by the noble families that sat on the council. Eventually, the Noveschi Party grew to include not only include members of the Nova council, but many prominent noble families of the city. Under the guide of the Nova and the Noveschi, Siena grew in both economic and militaristic dominance. In the 13th century, Siena was predominantly Ghibelline, in opposition to Florence's Guelph position (this conflict formed the backdrop for some of Dante Alighieri's Divine Comedy, completed in 1320). On 4 September 1260 the Sienese Ghibellines, supported by the forces of King Manfred of Sicily, defeated the Florentine Guelphs in the Battle of Montaperti. Before the battle, the Sienese army of around 20,000 faced a much larger Florentine army of around 33,000. Prior to the battle, the entire city was dedicated to the Virgin Mary (this was done several times in the city's history, most recently in 1944 to guard the city from Allied bombs). The man given command of Siena for the duration of the war, Bonaguida Lucari, walked barefoot and bareheaded, a halter around his neck, to the Siena Cathedral (Duomo di Siena). Leading a procession composed of all the city's residents, he was met by all the clergy. Lucari and the bishop embraced to show the unity of church and state, then Lucari formally gave the city and contrade to the Virgin. Legend has it that a thick white cloud descended on the battlefield, giving the Sienese cover and aiding their attack. The reality was that the Florentine army launched several fruitless attacks against the Sienese army during the day, then when the Sienese army countered with their own offensive, traitors within the Florentine army killed the standard bearer and in the resulting chaos, the Florentine army broke up and fled the battlefield. Almost half the Florentine army (some 15,000 men) were killed as a result. So crushing was the defeat that even today if the two cities meet in any sporting event, the Sienese supporters are likely to exhort their Florentine counterparts to "Remember Montaperti!". Siena was devastated by the Black Death of 1348, and also suffered from ill-fated financial enterprises. In 1355, with the arrival of Charles IV of Luxembourg in the city, the population rose and suppressed the government of the Nova council and expelled any family associated with the Noveschi Party. They established a Dodici (council of 12 nobles), assisted by a council with a popular majority. This form of government was also short-lived, soon replaced by the Quindici ("The Fifteen") reformers in 1385, the Dieci ("The Ten", 1386–1387), Undici ("The Eleven", 1388–1398) and the Twelve Priors (1398–1399) who, in the end, gave the city's lordship to Gian Galeazzo Visconti, the Duke of Milan, in order to defend it from Florentine expansionism. 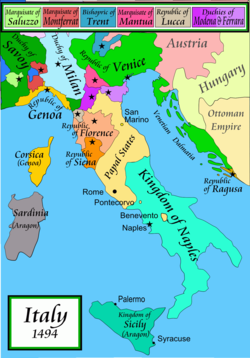 Five years later, the House of Visconti was expelled in 1404, and a new government of Ten Priors was established, this time in alliance with Florence against King Ladislaus of Naples. With the election of the Sienese Enea Silvio Piccolomini of the prominent Piccolomini noble family as Pope Pius II in 1458, the nobles who had been expelled due to association with the Noveschi party were allowed to return to the city. In 1472 the Siena magistrates founded a "mount of piety", the Banca Monte dei Paschi di Siena, which would survive into the 21st century as "the world's oldest bank". The Noveschi returned to the city under Pandolfo Petrucci in 1487. Pandolfo slowly gathered many political offices and grew his influence until 1500, when with the execution of his father-in-law Niccolò Borghese for conspiracy to murder him, as well as with the support of Florence and of Alfonso of Calabria, Pandolfo was able to seize complete control of the city. Though a tyrant, Pandolfo brought Siena back to prosperity, favoring arts and sciences, as well as improving its economy. Pandolfo was succeeded by his son Borghese Petrucci. After only 4 years of rule, Borghese was ousted by his cousin, cardinal Raffaello Petrucci, helped by Pope Leo X. In the wake of more responsibilities from the Church, Raffaello was forced to cede the city to his nephew, Franceso Petrucci, who only ruled for a year before being ousted by Pandolfo's youngest son, Fabio. Fabio was exiled in 1525 by the Sienese people, marking the end of the Petrucci era. With the end of the Petrucci era internal strife resumed, with the popular faction ousting the Noveschi party supported by Pope Clement VII: the latter sent an army, but was defeated at Camollia in 1526. Emperor Charles V took advantage of the chaotic situation to put a Spanish garrison in Siena. The citizens expelled it in 1552, allying with France: this was unacceptable for Charles, who sent his general Gian Giacomo Medici to lay siege to it with a Florentine-Imperial army. The Sienese government entrusted its defence to Piero Strozzi. When the latter was defeated at the Battle of Marciano in August 1554, any hope of relief was lost. After 18 months of resistance, Siena surrendered to Spain on 21 April 1555, marking the end of the Republic. The new Spanish King Philip II of Spain, owing huge sums to the House of Medici, ceded Siena's entire territory to the Grand Duchy of Tuscany (apart from a series of coastal fortress annexed to the State of the Presidi), to which it belonged for the next three centuries until the Italian unification in the 19th century. An exiled Sienese republican government of 700 Sienese families in Montalcino did not concede defeat in the Battle of Marciano and continued to resist Tuscan rule until 1559. Siena possessed most of the modern day provinces of Grosseto and Siena in the region of Tuscany in central Italy, including a coastline on the Tyrrhenian Sea. A notable exception is the hill town of Montepulciano 70 km southeast of Siena, which was claimed by the neighbouring Florence, and was a constant source of hostility between the two city-states. In the mid-16th century the Republic's territory had an area of approximately 8,000 km2 and a population of 80,000, including some 15,000 living in the town of Siena. Siena rivaled Florence in the arts throughout the 13th and 14th centuries: the important late medieval painter Duccio (1253–1319) was a Sienese, but worked across the peninsula. The mural titled "Allegory of Good Government" (Italian: Allegoria del Buon Governo) painted by Ambrogio Lorenzetti in 1338–39 at the Palazzo Pubblico, Siena's town hall, is considered a magnificent example of late-Medieval/early Renaissance art as well as a representation of the utopia of urban society as conceived during that period. During the early 13th century that the majority of the construction of the Siena Cathedral (Duomo) was completed. During the same period the Piazza del Campo grew in importance as the centre of secular life. New streets were constructed leading to it, and it served as the site of the market and the location of various sporting events (perhaps better thought of as riots, in the fashion of the Florentine football matches that are still practised to this day). A wall was constructed in 1194 at the current site of the Palazzo Pubblico to stop soil erosion, an indication of how important the area was becoming as a civic space. The limits on the Roman town were the earliest known walls to the city. During the 10th and 11th centuries, the town grew to the east and later to the north, in what is now the Camollia district. Walls were built to totally surround the city, and a second set was finished by the end of the 13th century. Much of these walls still exist today. On December 26, 1240, Ildebrandino Cacciaconti, the then podestà of Siena, signed a decree imposing a tax on citizens of Siena who rented rooms to students of the local "Studium Senese". The money from this tax went to pay for the salaries of the maestri (teachers) of the new University of Siena,. The studium was further supported when, in 1252, Pope Innocent IV declared both its teachers and students immune from taxes and forced labour levied on their person or property by the city of Siena. Moreover, the commune exempted teachers of law and Latin from their public duties. By the early 14th century, there were five teachers of Latin, logic and law and two doctors of natural sciences (medicine). Nowadays, the university is still among the most important Italian universities. In 1472 the Republic founded the Monte dei Paschi, a bank that is still active today and is the oldest surviving bank in the world. Consular 1125-1199 When ruled by a bishop, the elected consuls would represent the nobles, as well as the people. As episcopal power declined, theirs grew until 1167, when episcopal rule was expelled. The consuls continued to rule until a new government was deemed necessary. Podestà 1199-1234 A Podestà was an executive elected by the people as an absolute ruler. Ventiquattro (24) 1234-1270 Siena replaced its Podestà government with that of a council of elected officials. The number of officials fluctuated throughout the years, as shown by this chart. Priori 1385-1399 The council of the Priori was established in an attempt to stabilize the government and compete with Florence. It failed, however, with the number of Priors constantly fluctuating and Florence continuing its aggression. Visconti lordship 1399-1404 The Priors of Siena gave the city's command to the House of Visconti to protect it from Florence. Priori 1404-1487 With the House of Visconti expelled, the people set up another Priori government, this time with 10 Priors. Unlike the former Priori government, this one was stable. Petrucci lordship 1487-1525 The House of Petrucci gathered a great deal of influence and became quasi-rulers of the city-state until 1500, when Pandolfo Petrucci seized control of the city completely. Petrucci rule was a stable and prosperous time for Siena. Priori 1525-1548 A Priori government was installed in an attempt to bring stability back to Siena, which it never did. Capitano del Popolo 1552-1555 To protect the city, the people empowered a single ruler, the Capitano del Popolo, or Captain of the People. Republic of Siena at Montalcino 1555-1559 Following the conquering of Siena, the noble families held out at Montalcino. ^ "Short Story of University of Siena: 760 years of history". Università degli Studi di Siena. Archived from the original on 2008-03-09. Retrieved 2008-04-05.